If you've been told that you or a loved one have a hemothorax, you are probably very frightened. A hemothorax is defined as the accumulation of blood between the membranes lining the lungs (the pleura). Most of the time a hemothorax develops in a setting in which a person in a hospital, such as after lung surgery, with known lung disease, or following trauma, and depending on the cause, the blood may originate from the lungs, the heart, the chest wall, or the large blood vessels present in the chest. It's thought that close to 300,000 cases of hemothorax occur in the United States each year due to trauma alone, with chest injuries present in roughly 60 percent of patients with multiple trauma injuries. When a hemothorax develops, however, there is often confusion at first because there are so many similarities in the symptoms of a hemothorax and other respiratory complications. What should you know as you face this condition? Chest pain which is often sharp and may vary with position. pain with deep breathing may also occur. Trauma to the chest (this is the most common cause of a hemothorax). Lung cancer, mesothelioma, and cancers that are metastatic (spread) to the lung such as breast cancer and colon cancer. Chest surgery (most commonly following lung and heart surgery). Lung infections such as tuberculosis. Bleeding disorders that result in prolonged clotting, or excess doses of blood thinners. A careful history may give some clues to the cause and presence of a hemothorax—such as a chest trauma or chest surgery. On the side affected, lung sounds may be diminished or absent. 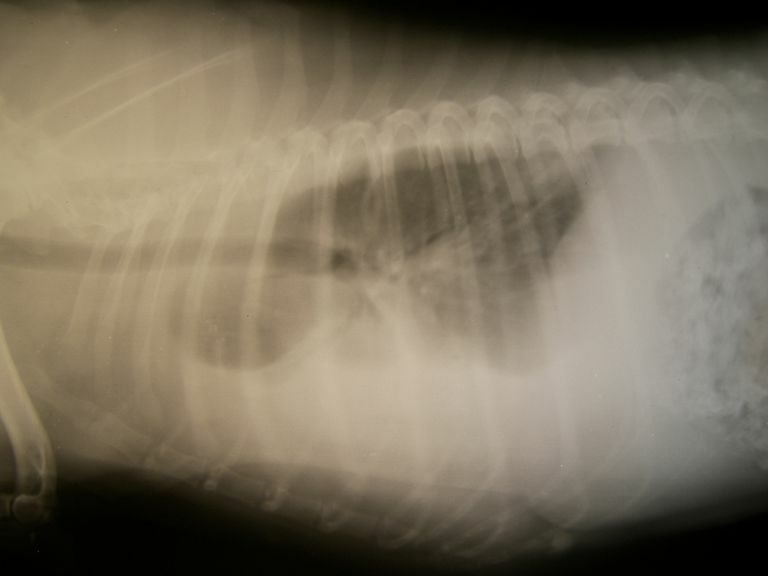 An upright chest x-ray may help to diagnose a hemothorax, and further testing, such as a chest CT may then be considered. When a chest tube is placed, the fluid may be evaluated to confirm the presence of blood in the pleural cavity and further look for possible causes. Evaluation of the pleural fluid can be helpful as well. For this fluid to be classified as a hemothorax, the hematocrit of the pleural fluid should be at least 50 percent of the hematocrit of the peripheral blood (blood examined by taking a sample from a vein). Initial treatment for a hemothorax usually involves stabilizing the person and then inserting a chest tube to drain the blood and air that has built up or is building up between the lung membranes in the pleural cavity. Often, a hemothorax is a result of blunt or penetrating trauma to the chest. When it occurs without trauma, it's very important to find and treat the underlying cause. Treatment usually involves inserting a chest tube as part of a video-assisted thoracostomy (a minimally invasive surgery in which small incisions are made in the chest and a surgery is done through these small incisions with the use of a camera). For some people surgery, a thoracotomy (open chest surgery in contrast to minimally invasive surgery) is needed to get to the source and control the bleeding, especially in the setting of large hemothorax or when the source of the bleeding is uncertain. For those people who receive treatment, a small number are left with an empyema (a collection of pus between the membranes lining the lungs) or some scarring of the pleura (pleural fibrosis). Fibrosis may result in long-term respiratory symptoms for some people. With an empyema, further surgeries may be done to remove the pus and to prevent further fluid and bacteria from entering the chest. Treatments for fibrosis are primarily supportive as fibrosis is usually irreversible. That said, treatments ranging from pulmonary rehabilitation to breath training can be helpful in restoring the best quality of life possible. The outcome of a hemothorax is determined by both the extent of the bleeding, and the underlying cause. For people who sustain a hemothorax as a result of chest trauma, the overall prognosis is actually quite good, and excellent if the hemothorax can be adequately treated. Prognosis may also be good when the hemothorax occurs as a complication of a biopsy or chest surgery. When a hemothorax occurs in the presence of cancer (due to growth of the tumor through the lung lining) or a pulmonary infarct, however, the prognosis is more guarded. If you or a loved one have experienced a hemothorax is can be terrifying. Fortunately, if the bleeding can be controlled and excellent medical care is available, treatment can sometimes resolve the problem with minimal long term effects. Aktas, A., Gozlek, E., Yazkan, R. et al. Transthoracic Biopsy of Lung Masses: Non-Technical Factors Affecting Complication Occurrence. Thoracic Cancer. 2015. 6(2):151-8. Morgan, C., Bashoura, L., Balachndran, D., and A. Saadia. Spontaneous Hemothorax. Annals of the American Thoracic Society. 2015. 12(10):1578-1582. Patrini, D., panagiotopoulos, N., Pararajasingham, J. et al. Etiology and Management of Spontaneous Haemothorax. Journal of Thoracic Disease. 2015. 7(3):520-6. Tanizaki, S., Maeda, S., Sera, M. et al. Small Tube Thoracostomy (20-22 Fr) in Emergent Management of Chest Trauma. Injury. 2017. 48(9):1884-1887.